Home Amazon Deals Fresh Step Multi-Cat Scented Litter, 34 pounds only $12.23 shipped! 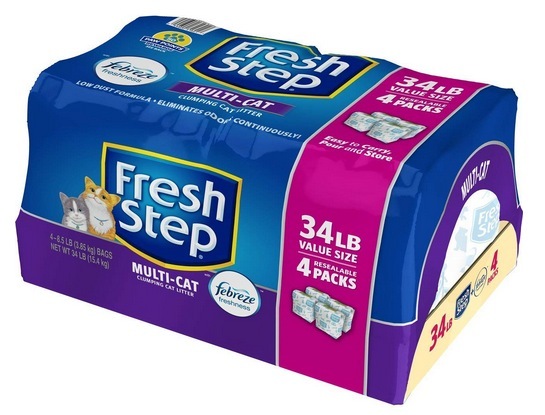 Fresh Step Multi-Cat Scented Litter, 34 pounds only $12.23 shipped! Amazon has this Fresh Step Multi-Cat Scented Litter with The Power of Febreze, Clumping Cat Litter, 34 Pounds for just $12.34 shipped right now! This is a really great stock up price for this brand! « Printed Silicone Bands only $8.99 shipped! Previous articlePersonalized Princess Pillowcases only $10.99 shipped! Next articlePrinted Silicone Bands only $8.99 shipped! Supercuts: $5 off Adult Haircuts Every Wednesday! iRobot Braava Jet Robot Mop for just $131.99 shipped!! LEGO Unikitty Cloud Car Building Kit for just $5.91 shipped! Free Mark Twain: The Complete Novels Kindle eBook!